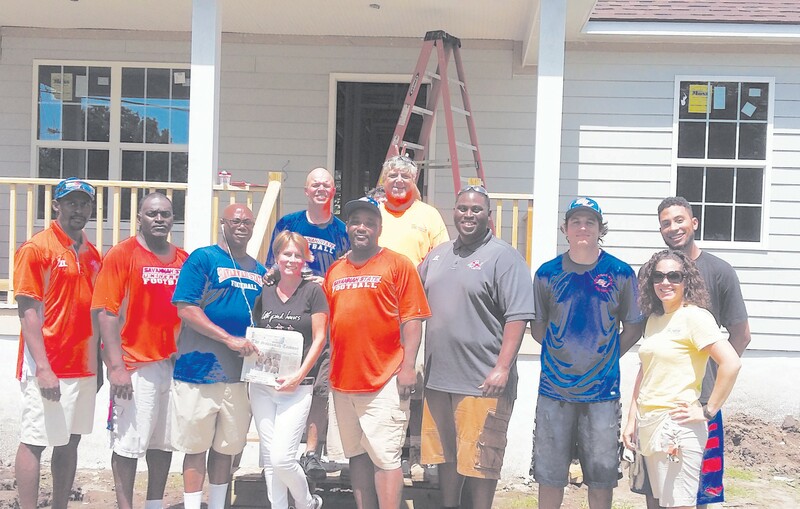 Coastal Empire Habitat for Humanity is bringing Women Build to the gridiron as the Savannah State University Football Tigers join to help finish the building of the Women Build house in the Summerside neighborhood. “We are thrilled to have the Tiger Football Coaches & team out with us—sharing their commitment to making a difference in the local community,” stated Michael Weathers, Executive Director. Coach Tony Pierce, who is heading this volunteer group. “We know we are the pillars in the community and wanted to share in the service to others. What a better way than doing something good for a family.” Coach Piece has previous experience on Habitat sites when he was coaching in Alabama. The Football Tigers was present on the Clinch Street development Wednesday, June 24th, 2015 morning from 9am-12Noon.